I suppose if there's any true story here it is that this story is truly a complete fabrication. 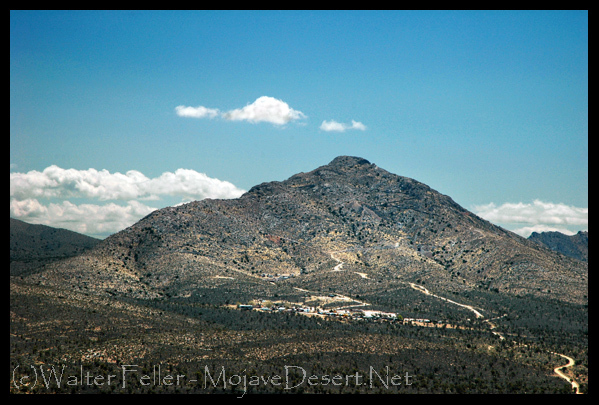 If there were what may be trillions of dollars in gold lying at the bottom of an 'unrediscovered' river running from the Great Basin under the Mojave Desert to somewhere near Laguna Beach, California, there would be at least a shred of evidence indicating such. Truthfully, I truly believe that the truth is, is that there is no truth to this true story. This is to certify that there is located in San Bernardino County, California, about 250 miles from Los Angeles, is a certain cave. Traveling over state highways by automobile, the cave is reached in about 10 hours. A civil engineer, Mr. Morton, and I spent four days exploring the cave for more than 8 miles. We carried with us altimeters, pedometers and a theodolite, with which to observe and record actual directions, take elevations and measurements by triangulation. 1. From the mouth of the cave we descended as shown by the altimeters to about 2000 feet, where we encountered a canyon, which from the altimeters and by calculations we found to be from 3000 to 3500 feet deeper; making a total depth of 5400 feet from the mouth where we entered the caves to the floor of the canyon. 2. We found the cave divided into many caverns or chambers, of various sizes, all filled and embellished with the stalactites and stalagmites, besides many grotesque in fantastic shapes that make these caves one of the wonders of the world. 3. The largest chamber we explored is about 300 feet wide, 400 feet long and from 50 to 110 feet high. It is encrusted with crystals, fashioned into fats dunes of innumerable stalactites, that hang from the ceiling, some of which are extremely large. One, the largest scene, is 27 feet in diameter and hangs 1510 feet down into a 3000 foot canyon. This great stalactites is perpetually washed by water flowing down over it and falling into the dark canyon depths. The huge glistening light crystal is 500 feet longer than the Eiffel Tower, and challenged us with amazement and wonder. 4. There is a flowing river on the floor of the Canyon, which rises and falls with title regularity. All measurements and estimates of the river, including its tides and beach sands were reckoned by triangulation, taken with the theodolite, and while we did not reached the river, nevertheless, taking observations without theodolite, and while we did not reach the river, nevertheless, taking observations with the theodolite and its telescope, we've reckoned the river to be about 300 feet wide at high tide and 10 feet wide at low tide. It rises and falls from 7 1/2 feet to 8 feet. The Peysert brothers confirm our reckoning. 5. When the tide is out, there is exposed on both sides of the river from 100 to 150 feet of black sand, which the Peysert brothers report is very rich in placer gold. They report the sands on the river sure to be from 4 to 11 feet deep, and on an average of about 8 feet deep. 6. There are numerous ledges above the canyon that are from 10 to 40 feet wide and covered with sand. We personally explored the ledge sands for a distance of more than 8 miles, finding little variation in the depth and width of the ledge sands. 7. I have known intimately Oliver, Buck and George Peysert from my boyhood. I have discussed these caves with them repeatedly and thoroughly. They have reported to me in detail, their experience in exploring the caves. One of them, George, lost his life in the cave. Buck and Oliver say. George was killed by diving in the river on the floor of the canyon. They carried lumber down to the river and constructed a sluice box and, using a pump, the three mined for six weeks, during which time they recovered more than $57,000 in gold, (gold at $20.00 per ounce); they sent their gold directly to the U.S. Mint and banked the returns in a bank in Needles, California, and another bank in Las Vegas, Nevada. I last talked to them in my home about November 10, 1934, at which time they repeated, their former statements, giving information as to how they discovered the River, and more of their experiences in lighting. They recovered several of the largest nuggets of gold ever found in California. Both Mr. Morton and myself felt our pockets with that Sands from the ledges, carried it out and had it assayed. Just what Mr. Morton sand assayed, I do not know, but it was approximately $2000 per ton. I carried out 10 pounds and 2 ounces of the ledge say. And panned 7 pounds, recovering more than $7.00 in gold, with gold at $20 an ounce. I sold the gold for $18 per ounce. The balance of my 10 pounds of sand I sent to John Herman, a Los Angeles assayer's assay certificate shows a value of $2144.47 per yard gold at $20.67 per ounce. 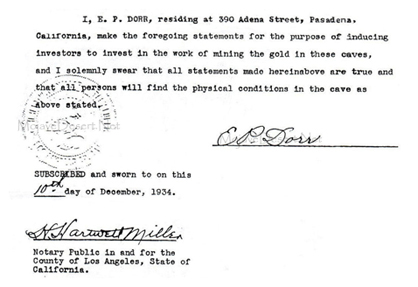 I, E. R. Dorr, residing at 390 Adena Street, Pasadena, CA, make the foregoing statements for the purpose of inducing investors to invest in the work of mining the gold in these caves, and I solemnly swear that all statements made herein above are true and that all persons will find the physical conditions in the cave as above stated.